Pyroclastic flow is a term that deserves a place in the popular lexicon. One of the most destructive volcanic processes, pyroclastic flows are mixtures of hot gas and rock that travel gravitationally down the flanks of a volcano at highway velocities. Their elevated temperatures and great mobility make them lethal to anything in their path. These flows include a basal component containing blocks of pumice or dense rocks and a dilute cloud of hot gas and ash that rises convectively above the moving flow. They can be formed by collapse of dense materials within a rising eruption column or directly from the volcanic vent. Pyroclastic flows include vesicle-rich pumice flows and dense block-and-ash flows formed by gravitational collapse of growing lava domes and active lava-flow fronts. Their travel paths typically follow topography. Pyroclastic surges, in contrast, are more dilute gas-rich flows that can have broader lateral extent less sensitive to topography. 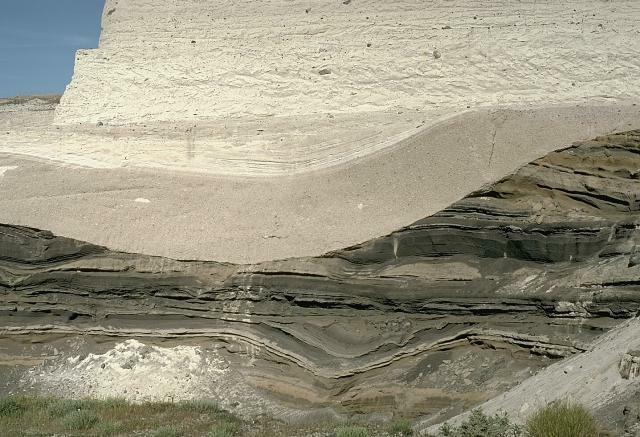 The dilute part of pyroclastic flows can become detached from the bedload portion and travel long distances over water. Extremely large-volume pyroclastic flows known as ignimbrites are produced during catastrophic eruptions and can travel long distances from a volcano, producing deposits tens to a few hundred meters thick. A pyroclastic flow sweeps down the SE flank of Mayon volcano in the Philippines on September 24, 1984. A thick column of ash rises above the surface of the moving pyroclastic flow, which was the largest of a series of pyroclastic flows that occurred during an eruption that began on September 9. Flow velocities of 50 m/sec were estimated from timed 35-mm photographs. The pyroclastic flow traveled 7 km from the summit vent, which is hidden behind the far left side of the ash column. Photo by Ernesto Corpuz, 1984 (Philippine Institute of Volcanology and Seismology). Ash clouds rise above a pyroclastic flow traveling down the Buang valley on the upper NW flank of Mayon volcano in the Philippines on September 12, 1984. The toe of the advancing pyroclastic flow is visible at the lower right. These pyroclastic flows traveled down to 100 m elevation at rates of about 20 m/sec. Photo by Olimpio Pena, 1984 (Philippine Institute of Volcanology and Seismology). 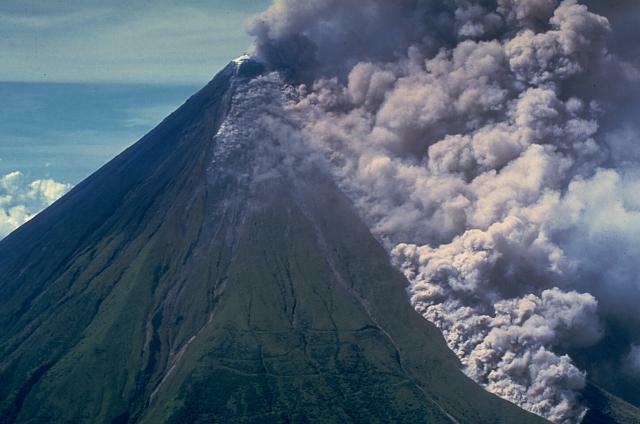 Voluminous pyroclastic flows on June 15, 1991, from Mount Pinatubo in the Philippines, swept all sides of the volcano. 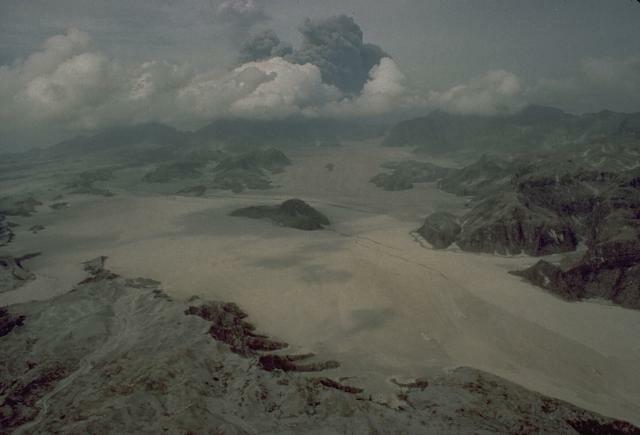 The flat, light-colored areas in the foreground are pyroclastic-flow deposits that filled the Marella River valley on Pinatubo's SW flank to a depth of 200 m, more than the height of the Washington Monument. The dark hill at the center was completely surrounded by pyroclastic flows, which traveled 14 km down this valley. 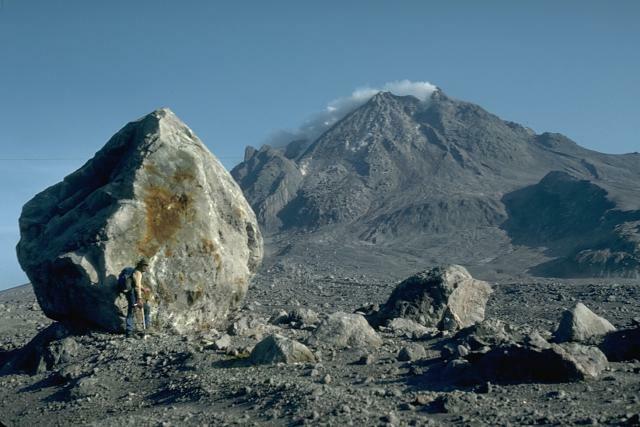 Photo by Rick Hoblitt, 1991 (U.S. Geological Survey). 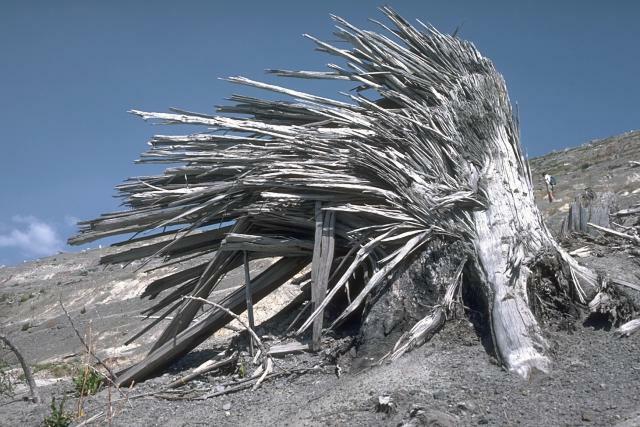 The powerful lateral blast of May 18, 1980 at Mount St. Helens totally removed large standing trees near the volcano, leaving jagged stumps with splinters facing away from the volcano parallel to the direction of movement of the blast cloud. "Warbonnet" stumps, such as this one (about 2 m high) on Harry's Ridge 9 km north of the crater, are a common feature near the volcano; farther away trees were felled and left in place. The gray layer behind the ruler was produced by the May 18, 1980 lateral blast of Mount St. Helens. The deposit is about 50 cm thick at this location 13 km NE of the volcano. 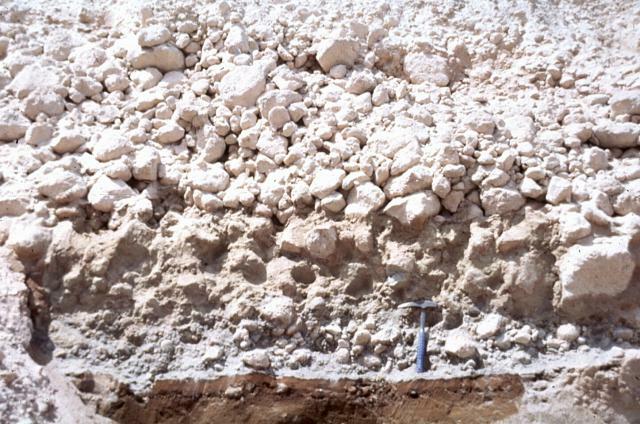 The blast deposit is overlain by airfall pumice produced later on 18 May, and underlain by a pumice deposit from an eruption in 1482 CE. 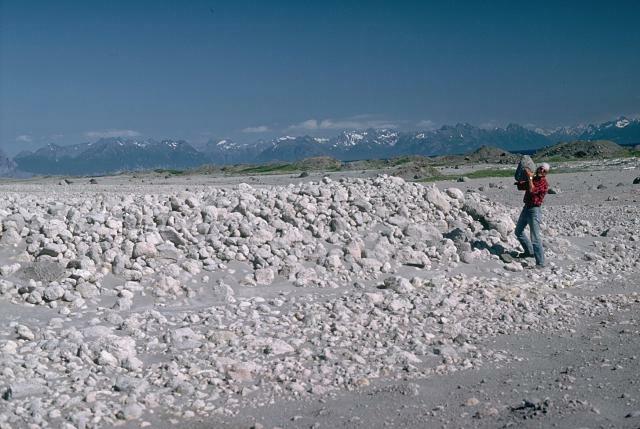 Pumice fragments from the May 18, 1980 eruption form a broad plain below Mount St. Helens in this May 23 photo. Pumiceous pyroclastic flows on May 18 traveled 8 km from the crater of Mount St. Helens to as far as Spirit Lake. A geologist can be seen holding a large, light-weight block of pumice. 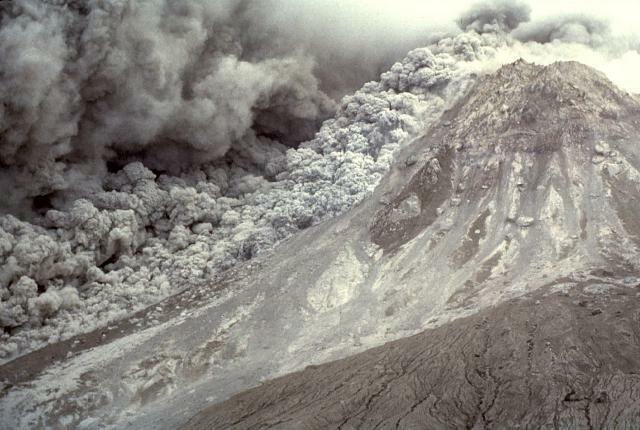 In addition to May 18, pumiceous pyroclastic flows were erupted on May 25, June 12, July 22, August 7, and October 16-18, 1980. Spectacular pyroclastic-surge deposits are exposed in gullies on the flanks of Cráter Elegante in the Pinacate volcanic field of NW México. 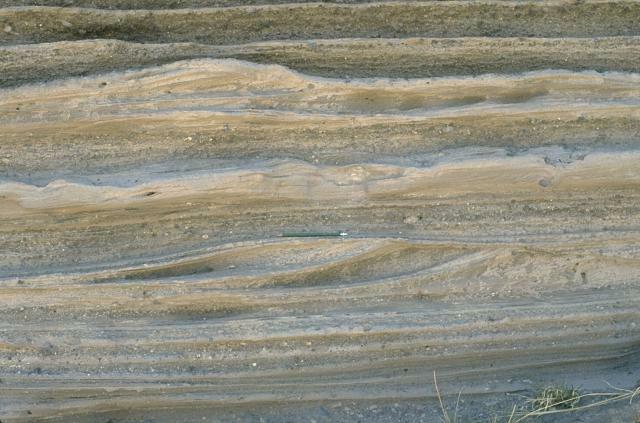 This photo shows cross-bedded sandwave bed forms produced by particles transported by saltation or dilute suspension in a rapidly moving surge cloud. The direction of movement of the surge cloud, seen by the truncation of dune beds on the near-vent side, was from right to left. Sandwave beds predominate in areas near the rim of the maar. Photo by Bill Rose, 1997 (Michigan Technological University). 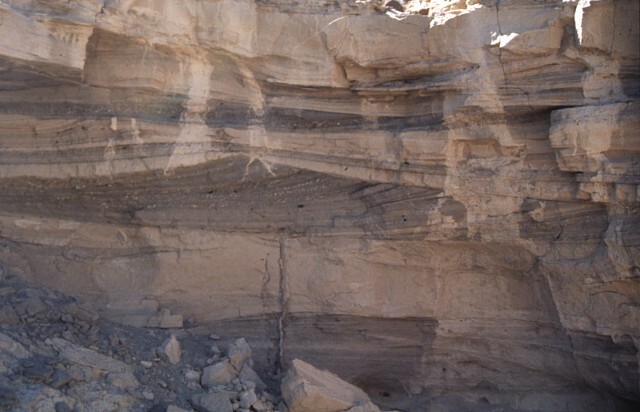 Pyroclastic-surge deposits from La Breña maar in México's Durango volcanic field show both laminar and dune bedding forms. 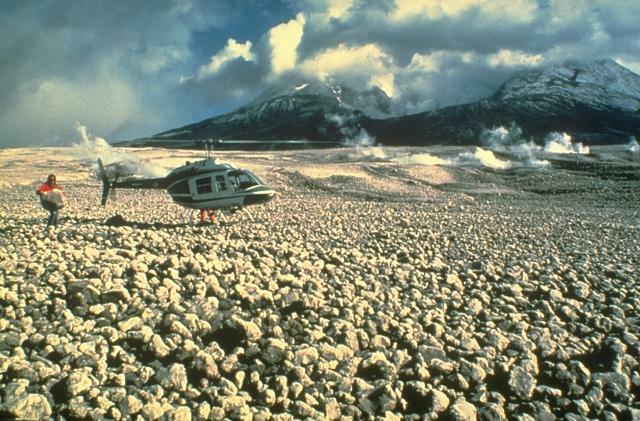 The thin beds (note the pen in the center for scale) were created by successive explosive eruptions that produced high-velocity, laterally moving pyroclastic surges that swept radially away from the volcano. The direction of movement of the surge clouds was from right to left, as seen from the truncated dune beds on the near-vent side. Photo by Jim Luhr, 1988 (Smithsonian Institution). 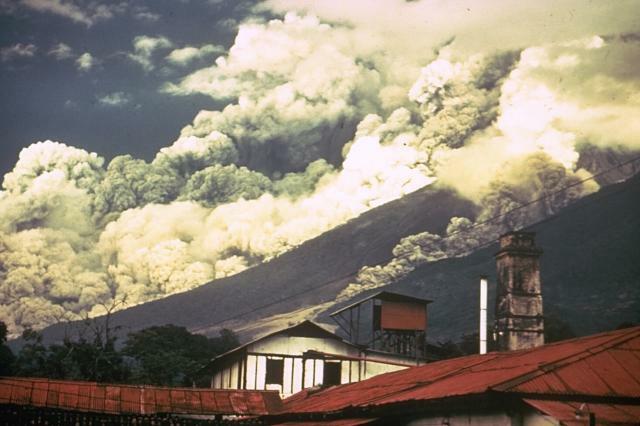 Pyroclastic flows sweep down the east flank of Fuego volcano, Guatemala, in October 1974, during one of the largest historical eruptions of the volcano. Ash clouds rise off the base of the pyroclastic flows, which traveled up to 7 km from the summit at estimated average velocities of 60 km/hr. The travel direction of pyroclastic flows is influenced by topography. The denser basal portion of the pyroclastic flows follows topographic lows on the flanks of the volcano--note a smaller pyroclastic flow descending a gully at the right. Photo by William Buell, 1974. 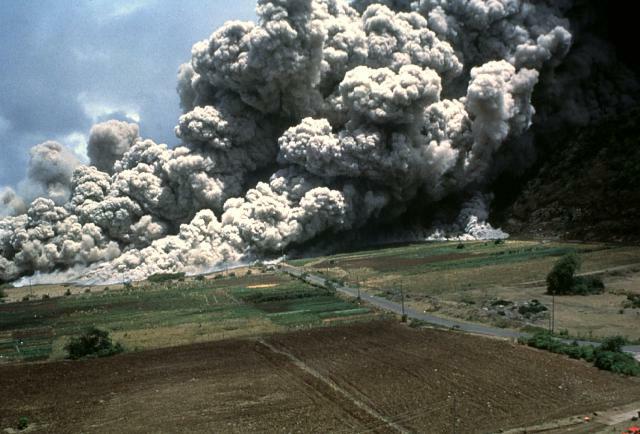 A devastating pyroclastic flow on June 25, 1997 sweeps across the lower NE flank of Soufrière Hills volcano on Montserrat. More than two dozen people within the officially evacuated zone were killed by this pyroclastic flow. 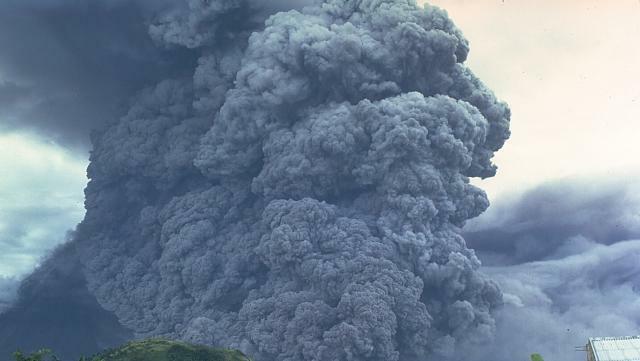 The June 25 eruption sent a plume to ~10-km altitude and produced pyroclastic flows and surges that overran both vacated and partly inhabited NE-flank settlements, destroying 100-150 houses in eight villages within the restricted zone. The pyroclastic flow traveled 4.5 km and reached almost to the sea. Photo by Paul Cole, 1997 (Montserrat Volcano Observatory). Cauliflower-like clouds of ash roil above the surface of a pyroclastic flow sweeping down the eastern flank of the summit lava dome on January 16, 1997. This was the largest single pyroclastic flow of the eruption to date. 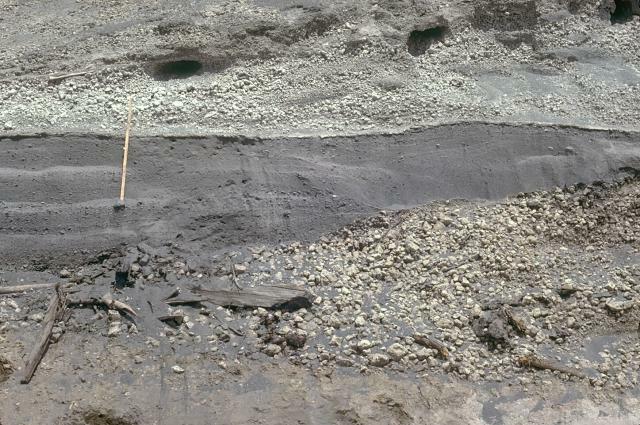 The pyroclastic flow descended the Tar River valley to the sea, covering the new delta with new material that included blocks 1-2 m in diameter (up to 5-m diameter at the head of the fan). Photo by Richard Heard, 1997 (Montserrat Volcano Observatory).